The 1986 World Cup was the first to introduce a last 16 knockout phase and every match from this point on – bar the third place play-off – was shown live on British television. Highlights in the second round included an epic 4-3 win for Belgium over the Soviet Union, the Euro ’84 winners France beating World Cup holders Italy 2-0 and the much-fancied Denmark being surprisingly crushed 5-1 by Spain. But the standout moment arguably involved the hosts, as Mexico defeated Bulgaria 2-0 and Manuel Negrete scored with a spectacular scissors kick. 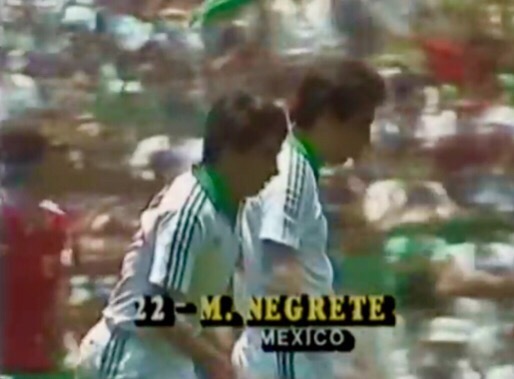 BBC commentator Barry Davies was so in awe of the goal that he would cry “Negrete-e-e-e-e-e-e-e-e”, prolonging the final syllable of the player’s name. “I gave a passable imitation of a Latin American commentator,” he wrote rather proudly in his autobiography. The generic caption shown around the world after Manuel Negrete scored for Mexico against Bulgaria. Despite failing to win their group, England were up against one of the weaker surviving nations in the last 16 in Paraguay and duly beat them 3-0 as excitement grew about their chances. The match was screened live by both the BBC and ITV, the latter enjoying unusually high ratings in a head-to-head fight after going on air straight after a high-profile episode of Coronation Street in which the Rovers Return burnt down. But attention quickly turned to what next lay in store for England – a Sunday showdown with Argentina. Just four years on from the Falklands War, the political connotations of the fixture would be frequently raised at press conferences. England’s new goalscoring hero Gary Lineker simply said in a TV interview: “We’re footballers, not politicians.” But there was no doubting this match would attract a particularly high level of interest. On June 22, England met Argentina in the Azteca Stadium for a match that would never be forgotten. Once again the BBC and ITV were both showing it live, as millions back home tuned in for the 7pm kick-off (BST). There wasn’t much to get excited about in the first half, but in the infancy of the second period the game turned on Diego Maradona’s ‘Hand of God’ goal. Davies spotted England players protesting and jumped to the wrong conclusion over why they were complaining. 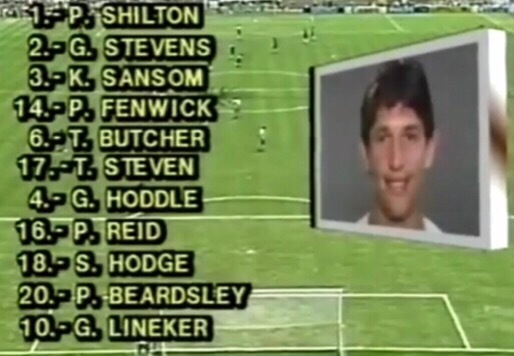 How the team line-ups were presented during Mexico ’86, with this being England’s side against Argentina. “They’re appealing for offside,” he told viewers, still concluding that was the source of England’s annoyance until action replays showed it wasn’t. ITV’s commentary team were quicker on the uptake. “Everyone knows,” said co-commentator David Pleat. “HE certainly knows,” responded Martin Tyler, as Maradona celebrated the goal being given. In his autobiography, Davies held his hands up for calling it wrong and reminded us of the lack of technology he had at his disposal in the stadium. He wrote: “It was a match of magnificence and malevolence, marred for me not only by the manner of the first goal but by the fact that, like the referee and linesman, I didn’t spot the handball. Some of the replays were cut in, unseen by me, for me to commentate, with the voice from London in my ear saying ‘They’re going up for the ball now, there’s the hand’, and so on’.” Viewers were certainly given plenty of chances to see it again, this being a World Cup where the goals would be replayed from three different angles (this was considered quite an advanced move at the time). TV replays helped confirm Diego Maradona had handled the ball. Within minutes, Maradona scored another unforgettable goal after a mesmerising dribble that began in his own half. Davies redeemed himself with his celebrated line of “you have to say that’s magnificent”. Few would argue with that, as Davies proclaimed the goal as “pure football genius” to emphasise the contrast from Maradona’s first. 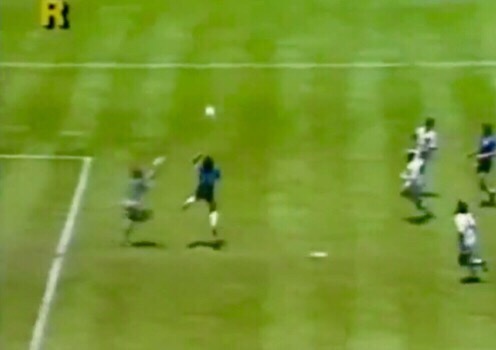 Over on ‘the other side’ (as people would still say at the time), Tyler was immediately proclaiming it as one of the World Cup’s great goals. After this the game threatened to fizzle out until substitute John Barnes provided a perfect cross for Lineker to score. But it would be a near-replica move with time ticking away that stuck in the mind more. As Barnes won the ball, Davies said: “Every Englishman will surely be saying ‘go on, run at them’.” Barnes whipped the perfect cross into the box where Lineker lay in waiting. Davies and Tyler both instinctively proclaimed it was a goal before abruptly realising Argentina had somehow kept the ball out. And that was just about that, those painful words we hear every four years of “and England are out of the World Cup” duly uttered by Davies at full-time. Graphics shown at the final whistle as England were eliminated. For Bobby Robson the World Cup dream was over, as he digested Maradona’s first goal being given when he believed he had clearly seen a hand used. “Maradona handled the ball into the goal, didn’t he?” he asked rhetorically during a televised press conference, as his anger grew. “DIDN’T HE?” It was a debate that would continue for years. But England departed after a quarter-final weekend in which the match between France and Brazil had proved particularly enthralling. The quarter-finals were generally more memorable than the semi-finals, which were less dramatic than in some World Cups. West Germany’s 2-0 win over France lacked the sparkle of their classic meeting four years earlier and Argentina were fairly untroubled in beating Belgium 2-0. But Maradona’s two goals again got everyone talking, particularly about another superbly taken second. “Fantastic goal. Unbelievable. World class,” purred John Motson, commentating live for the BBC. ITV bill the 1986 World Cup final. 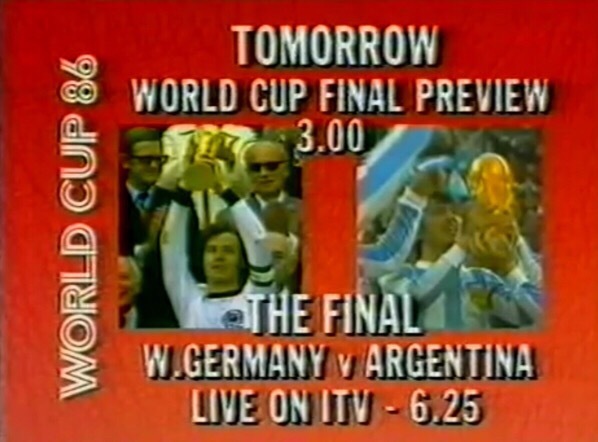 The final was as usual screened live by both the BBC and ITV, with Brian Moore at last commentating for ITV on a World Cup match from the stadium as he went out to Mexico just for the final. It was a bit of an odd idea. Moore had stayed in London due to being the lead presenter but it seemed he could be spared this role for the showpiece occasion of the final, yet not for the Argentina-England match a week earlier. It also meant Tyler, who commentated on the final four years earlier and had covered England’s matches during the finals, was denied the opportunity to describe the 1986 final. For Moore it was a taste of things to come, as he was axed from his role as host of Midweek Sports Special this year and he was now left to focus on commentating. There was also the delicate situation for ITV of having both Bobby Robson and Kevin Keegan on their final coverage at the stadium after they infamously fell out shortly after Robson became England manager. Moore recalled in his autobiography that the pair were based in different parts of the ground, meaning they would not have any contact during the broadcast (Robson claimed in his World Cup Diary the pair had shaken hands a few days earlier when they bumped into each other, perhaps suggesting they could have worked together on the final). No such problems over on the BBC, where John Motson was commentating with Jimmy Hill accompanying him in the commentary box. Des Lynam was joined by regular pundits Lawrie McMenemy and Terry Venables along with Lineker, who was hoping to end the night as top scorer in the World Cup. 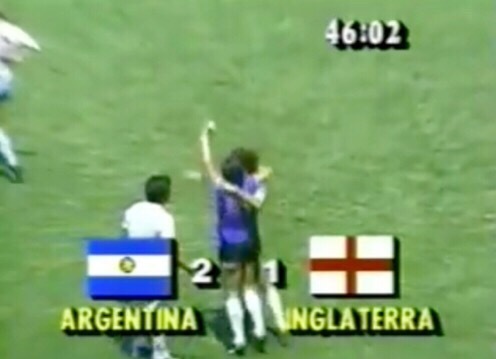 Prior to kick-off, viewers could enjoy the top 20 goals from the finals with Maradona’s second against England topping the bill. The final saw Argentina lead 2-0, be pegged back to 2-2 before Jorge Burruchaga scored a late winner as they won the World Cup for the second time. “The world’s greatest player receives the world’s most important football prize,” said Motson as Maradona collected the trophy. It was a tournament Maradona had owned, although his failure to score in the final meant Lineker won the Golden Boot. Lineker’s stock was rapidly growing and there was increasing speculation he would be off to Barcelona, managed by Venables. With both men in the studio, Lynam couldn’t resist asking if the deal would be going ahead. After Venables had expressed his hopes for the move proceeding, McMenemy grumpily told the others “I think you’re all out of order” for bringing the subject up – telling Lynam he should have been asking Everton manager Howard Kendall instead. McMenemy’s outburst meant the conversation now felt pretty awkward and any Evertonians watching would have not felt assured that Lineker planned to stick around when he simply told Lynam: “I shall be playing for the team I want to be playing for next season.” To the surprise of few, Lineker duly completed his move to Barcelona. It had been a life-changing tournament for him, setting him on the way to later hosting Match of the Day. Do you have any favourite memories of the TV coverage from the 1986 World Cup? If so, please feel free to share them below.